For the past two days we have had some wonderful ladies, sharing with us on how to make cute hair accessories. Today I am excited because we have Kayla, from Freckles in April, sharing a hair secret. I don't know about you, but I am always looking for a good hair secret to take me from drab to fab. Kayla is just the one to do that. 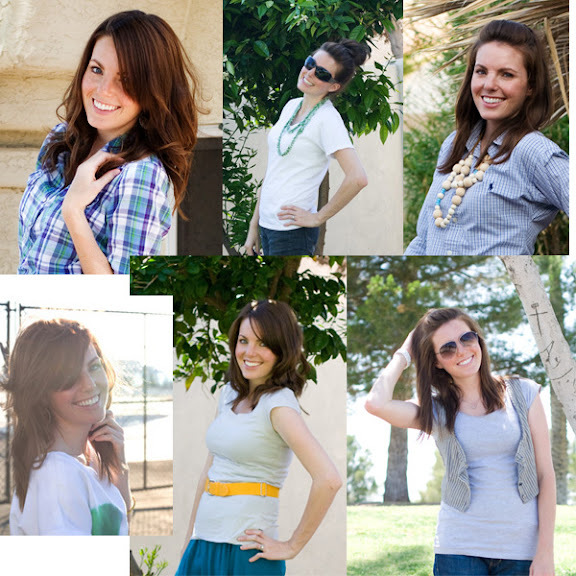 She has a fashion blog that inspires me everyday. She also throws in a few re-purposing projects for some added flair to her cute blog.She is modest, fashionable, witty, and a mama to boot. How she stays looking cute in her heels, with littles around, is a mystery I am reading to find out. When left to its own devices my hair is pretty dang boring. It's flat, uninspiring, and it's so slick that a hair tie struggles to find a grip. Fortunately, a few years ago I discovered sea salt spray. I loved what it did for my hair, but it was too expensive for daily use, so I usually had one good hair day followed by five blah ones. Just as my pricey sea salt spray ran out, Not Martha posted a DIY version. The heavens opened and behold, I have had a string of pretty darn good hair days ever since. It's my secret weapon and I'm not even sure how to do my hair without it anymore. Just so you know, if your husband asks, "What are you doing?" And you respond with, "Making a hair collage!" he WILL think that maybe you've lost it just a little bit. But I wanted to demonstrate the versatility of the spray. Clockwise from top left we have straightening iron curls, blogger bun, soft waves, pin straight, Whoorl curl, and air dried and left to its own devices. All done with sea salt spray. Mix together in a squirt bottle (I got a little one for 99 cents from Target) and shake well. My super cheap CVS hair gel worked just fine, BUT the nicer stuff I picked up from my stylist worked even better. Better quality gel will yield better results. Wash and condition your hair and towel dry. Then give your hair a good allover spritzing with the spray. I try to concentrate on my roots but I make sure to get my ends as well. Comb through. Blow dry. I try to heat style as little as possible so I usually just blow dry my roots and then let the rest air dry. This is important- only brush out your hair from the ears down. If you brush at the roots you're going to lose the volume. Then straighten, curl or pin up as usual. The spray adds texture and will help your hair hold the style. My style lasts for days with this stuff. I've never tried sea salt on my hair...I wonder how it would change my baby-fine locks? Hrm, something to add to the "Heidi, try this!" list. Hey Danielle, great tips! Hey I'm trying to get in touch with you since you were the winner from my blog giveaway drawn Monday. I emailed you and thought maybe posting would help. I will email you again as well. Please contact me so that I may ship out your prize to you! Thank you for entering have a great day! Super great idea! My hair is the flattest ever, can't wait to try this! This is awesome!! Love this Idea!! A sea salt glow is in face a sea salt scrub. These scrubs are with the purposes of exfoliation and hydration at the same time.